Generally, when the words duct insulation and acoustics appear in the same sentence, I usually think duct liner and sound absorption. If I am having a more cerebral moment, I may think insertion loss or friction loss. But that is not all there is to HVAC duct insulation. While duct liners certainly play an important role in providing thermal and acoustical insulation for HVAC systems, duct coverings or duct wraps also provide important alternatives. In its simplest form, duct lining (traditionally fiber glass), would be installed in rectangular ducts as part of an automated process while the duct is being fabricated on a full coil line. This process has the lowest manufacturing costs, and you can make large quantities of duct quickly. The cost and speed advantages may be reduced because every transitional piece (elbows, reducers, and rectangular to round) must be fabricated and insulated manually. The biggest disadvantage of lining ducts with a coil line is that there are very few insulation materials that can be applied on coil lines. This means specified design criteria—such as closed cell or antimicrobial properties—may not be met with this limited selection. In these cases, the desired insulation material must be applied by hand, which is very labor intensive and increases the cost significantly. Round and oval ducts always must be insulated manually, which again, increases the difficulty and cost of insulating the duct. There is also the issue of double wall duct construction for round or rectangular ducts. Double wall duct has the benefit of isolating (solid inner layer) or semi-isolating (perforated inner liner) the duct liner from the air stream, which is desirable for a number of reasons (e.g., keeping particulates out of the air stream and protecting the liner from harsh environments). However, double wall duct fabrication and field installation has its own set of disadvantages, such as added initial cost, added weight, and a more difficult installation. Additionally, a solid inner layer means that no sound absorption is taking place. It is important to note why ducts are insulated. Ducts can be insulated for sound control (acoustics), but they are also insulated for thermal performance, including controlling heat gain or loss, maintaining uniform heating or cooling throughout the air-handling system, and preventing condensation. In general, 2015 IECC energy codes can require R-values of 4.0 or 4.2 for duct passing through conditioned spaces, 6.0-8.0 for ducts passing through unconditioned spaces, and 8.0-12.0 for outdoor ductwork. These R-values can be obtained by either lining or wrapping the duct. Cost becomes a consideration when lining with thicker insulation as lining requires increased duct size to maintain an adequate cross-sectional area to maintain proper air flow. Wrapping, or a combination of wrapping and lining, may be more cost-effective alternatives. Regardless of the R-value requirements, the insulation material used must have a maximum flame spread and smoke developed rating of 25 and 50, respectively, when tested in accordance with ASTM E84 Standard Test Method for Surface Burning Characteristics of Building Materials (or equivalents UL 723 and NFPA 255); ASTM E2231 Standard Practice for Specimen Preparation and Mounting of Pipe and Duct Insulation Materials to Assess Surface Burning Characteristics in the United States; CAN/ULC-S102 Standard Method of Test for Surface Burning Characteristics of Building Materials and Assemblies; and/or CAN/ULC-S102.2 Surface Burning Characteristics of Flooring, Floor Covering and Miscellaneous Materials and Assemblies for materials that cannot be properly supported in a realistic test configuration or thermoplastic materials for Canada. As previously mentioned, lining a duct is typically chosen over wrapping for acoustic performance, and acoustic insulation is typically equated with sound absorption. Open cell lining materials such as fibrous insulation or open cell foam insulation provide the best sound absorption performance when tested per ASTM C423 Standard Test Method for Sound Absorption and Sound Absorption Coefficients by the Reverberation Room Model. They also provide good initial R-values. Following is a non-technical summary of ASTM C423: the insulation material is placed on the floor of the test chamber, and then different frequencies of sound are thrown into the room. Sound that bounces back is measured, and the difference between “in and out” is what is absorbed. Using the standard calculation methods, performance can be summarized by a single numeric value, referred to as the noise reduction coefficient (NRC). Lining materials can be compared for sound absorption performance by looking at the NRC of the materials at the same thickness (and mounting method). It is also good to look at the sound absorption at different frequencies, as the lower frequency performance is typically equated with reduction of mechanical noise, such as fan noise, which is the primary concern in air-handling systems. In a properly designed air-handling system, open cell liners absorb sound very well, as do some closed-cell liners. The ostensible goal of absorption is to keep the air flowing quietly into the room. This, however, is an oversimplification, as there a many other variables that affect this, including diffuser types, duct size, and air flow rates. While many rooms have air flow that is barely audible or provides a pleasant white noise, when not properly insulated, the noise can rise to a level that disrupts room occupants. Noise that distracts the room occupants is not conducive to productivity, whether it is a work space, meeting room, or a classroom. While sound absorption is important, there are other types of sound transmission that come into play in air-handling systems. Radiated noise or breakout noise is another form of noise that has to be considered. ASTM E90 Standard Test Method for Laboratory Measurement of Airborne Sound Transmission Loss of Building Partitions and Elements can be applicable when considering radiated or breakout noise. The non-technical description of ASTM E90 is as follows: there is a wall, and on one side of the wall is a known sound source, and on the other side of the wall is you (strategically positioned). What you hear is the transmitted sound. The ability of the wall to block the sound is represented by a numeric value referred to as the sound transmission coefficient (STC rating). If a duct is passing through a room and it is loud due to air flow and/or mechanical noise (e.g., rattling), the end result can be the same disruptive noise that reduces productivity. In this type of application, a material with a good STC rating (such as a closed cell insulation or a mass loaded elastomer or vinyl) can reduce the noise to acceptable levels. But unlike sound absorption, where the duct is lined, sound transmission can be controlled through the use of duct lining or duct wrap. • Heating coils and possibly UV sterilization equipment that can degrade certain liners, which impacts liner selection. Moisture in an air-handling system can result in mold growth on or within the lining material. Moisture absorption can also reduce the R-value, which can result in condensation on the outer duct surface. This condensation can result in damage to other materials such as ceiling tiles, walls, and carpeting. There are also concerns about particulate matter, which can be a mechanical or respiratory irritant, and volatile organic compounds (VOCs) that can also adversely affect indoor air quality. In cases where IAQ is of the utmost importance, such as in hospitals, wrapping the ducts may be the preferred option. There are many considerations when specifying materials, and lining a duct is more complicated than wrapping a duct. Removing liner from the airstream addresses the IAQ concerns and makes duct cleaning easier. It also eliminates the need for double wall ducts and reduces the amount of sheet metal since the effective area of the duct is increased. On the other hand, design changes to the air-handling system are needed to control unwanted noise. Lower air velocities, bends in the ductwork, and mechanical sound attenuators can accomplish noise control in unlined ducts. But, attenuators are an additional cost and take up additional space. Additionally, energy code requirements and control of breakout noise have not been met. A wide variety of materials can be used for duct wraps for both the insulation and jacketing. As duct wrap is installed on site, there are fewer concerns about insulation damage during shipping, on site storage, and installation (problems that can crop up with lined ducts). Repair of duct wrap is easier and less disruptive than repair of duct liner. Duct wrap takes up external duct space, so consideration must be given to provide adequate clearance for installation as well as room to work. Depending upon the scheduling, duct wrap can be susceptible to damage from other trades. Duct wrap can take the form of rigid or flexible insulation materials, and the selection process should be based on a variety of conditions: round, oval, or rectangular ducts; indoor or outdoor installation; insulation R-value only or breakout noise control only, or both; and type of facility (e.g., office, residential, retail, school, hospital/medical building, cleanroom, food and beverage, or pharmaceutical production environment.) There are materials available to meet all of these needs. Just like the duct wrap materials, there are a wide variety of jacketing options to meet project requirements. There are the “traditional”: metal jacketing, PVC and mastic, and mesh. For some applications the newer ASJ or FSK jackets may be adequate. Then, there are a variety of peel-and-stick type materials available from various manufacturers. There are insulation materials available in sheet and roll form with pre-applied jacketing, which can reduce field installation time (and cost) while allowing for installation over a wider variety of environmental conditions. The latter are important considerations since field insulation installation costs are typically higher than liner costs and installers often have little control over the working conditions, which can vary greatly by geography and season, regardless of whether installation is taking place indoors or outdoors. In selecting insulation and jacketing materials, it is important to select a system that will withstand the rigors of maintenance and modifications over the life of the building. While it would be ideal to go through all the aforementioned design and performance considerations before writing a project specification, unfortunately that may not be the case. However, it is important to develop an understanding of the owner/specifier’s goals and objectives and then offer an alternative that does a better job of meeting these goals or meets them more cost effectively. This is a competitive environment. Alternatives to traditional lined or wrapped metal duct are becoming acceptable options for a wider range of application, whether they are pre-insulated flexible duct, duct board, PVC, or phenolic duct. 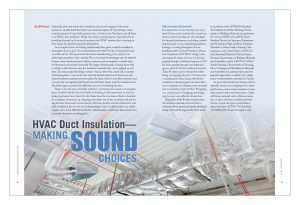 Lining and wrapping both have their advantages and disadvantages, but with careful consideration and planning, each can provide a viable option to meet a project’s air-handling system needs.